-Only take over the counter medication such as aspirin or alleve if necessary and only as directed. -Where the pain is may not be where the problem is so always consult with a physician if pain persists or increases. 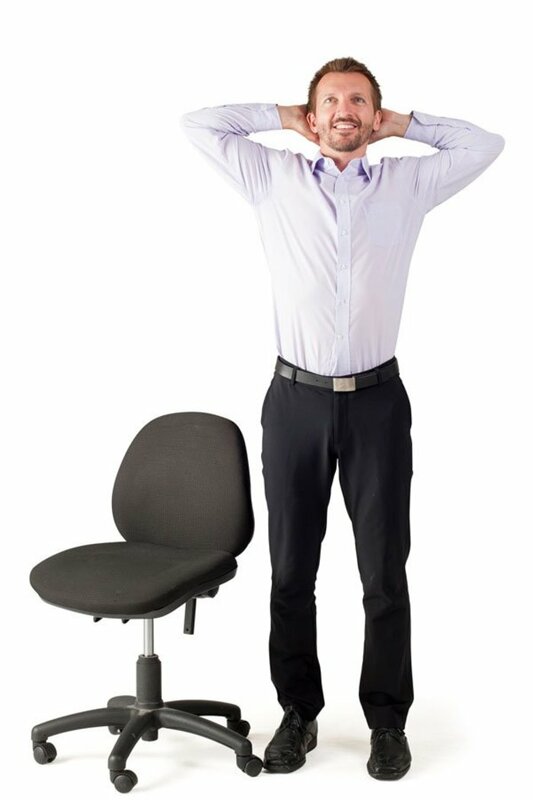 Perform in an upright sitting position while holding on to a seat to keep your shoulders in place. Stretches are to be held for 10-15 seconds in each position, and should be a gentle steady stretch with no pain and no dizziness, if either occurs reduce the stretch, if they persist then discontinue the stretching. How far you are able to stretch is not as important as maintaining each stretch in a comfortable stretch position for 10-15 seconds. -Begin by turning your head to the left and hold for 10-15 seconds and then repeat to the right. -Bend your neck towards your left shoulder and hold for 10-15 seconds and then bend to the right shoulder. 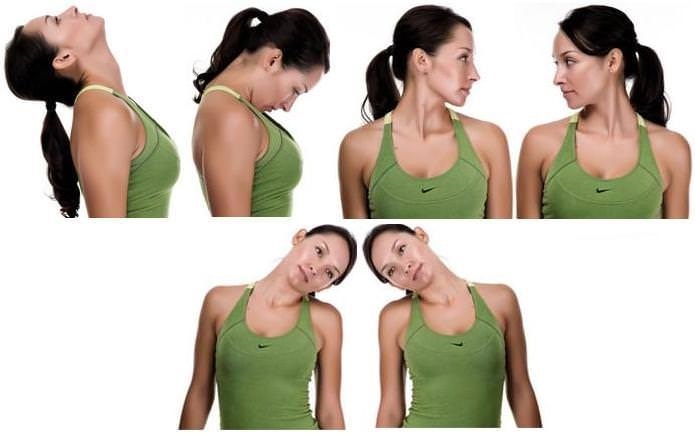 -Lean your head back for 10-15 seconds, if necessary use your hands to bring your head forward. -Bend your head down at an angle towards your left chest for 10-15 seconds and then towards your right chest for 10-15 seconds. These 7 stretches make up one set. Do 3 sets at a time, 3 times a day for maximum benefit. Etc- Do not roll your neck in a circle or force it to crack. This may aggravate the cause of the pain even it feels better temporarily. Straight Arm Stretch- Place one arm straight in front of you with your hand in a fist. Then place your other hand over top of the fist. Push your arm with the fist forward to stretch the muscles between your should blades. Hold this stretch for 10-15 seconds and then repeat with opposite side. Overhead Stretch- Position your arms straight in front of you and place one thumb into the palm of the other hand. Lift your arms up overhead as far as you comfortably can and hold there for 10 seconds. Place the tips of your fingers on either side of your head and then bring your elbows back as far as you comfortably can and hold for 10 seconds. Shoulder Stretch- Bring one arm across your chest and then reach over with your other arm and grab your upper arm area and pull gently in the direction of you arm. Then repeat with opposite arm and can be done by reaching under as well. Scapula (shoulder blades) Circles- Place both arms outstretched with palms up and a slight bend in the elbows. Move the arms in a backwards in a small circle by moving the shoulder blades not the shoulders. This should provide a good stretch for the chest muscles and movement in the upper back muscles. Perform for 20-30 seconds at a time. Corner Stretch- Lean into a corner and place you forearms perpendicular to the ground evenly on the walls with your upper arms at shoulder level or slightly higher. Lean in gently and equally to stretch the upper chest and shoulder muscles for 15 seconds at a time. Etc- No pain should be increased during the stretches if so back of and if it persists then do not continue with that stretch. Do remember to let your upper shoulders relax and check your posture frequently. Perform following any prolonged postures and/or 3 times a day. Do not do standing toe touches, sit-ups, back extensions, force your back to crack, stay in the same position for an extended period of time or lay on your stomach! Knee to Chest- Lay on your back with your knees bent and feet flat. Keeping your head and neck relaxed, grab behind one knee (or place a towel behind your knee and pull the ends) and bring the knee towards your chest. Hold it in that position for 10-15 seconds and then move the leg slightly forwards and backwards to "pump" the muscles. Then repeat with the opposite leg. This can be done with the other leg straight or with both knees at the same time. If any pain is felt stop immediately. Lie on your back and bend one knee. Slowly bring that knee across your body holding the upper leg with the opposite hand as it moves down. Do not force it rather let the weight bring it down and allow your body to move with it if tight. Maintain the stretch for 20-30 seconds and stop if painful. The goal is to gently motion and stretch the muscles not to crack your back. Position yourself on your hands and knees. Begin by arching your back upwards similar to a cat raising their back up. Follow this by arching your back downwards similar to a wolf howling at the moon. These positions will gently motion the muscles from the lumbar to the pelvis. Gymnic ball- Figure 8 motion and traction stretch- Perform only after proper instruction. Where the pain is may not be where the problem is so always consult with a physician if pain persists or increases.